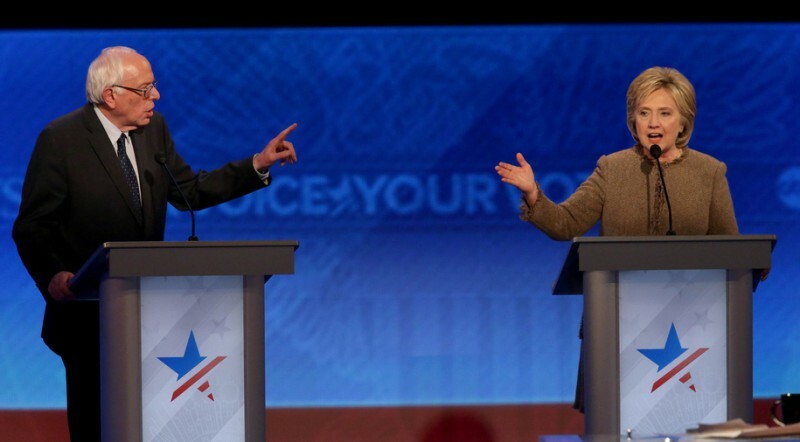 Sanders vs. Clinton: Idealist vs. pragmatist? Or revolution vs. establishment? After too few debates, Iowa voters get first crack at making a choice. Who will come out on top? Finally–it’s the Iowa caucuses. Then at least we won’t have to evaluate which polls are right in Iowa. You’ve got the CNN/ORC Poll that shows Vermont Sen. Bernie Sanders with a comfortable lead of eight points. Or the Loras College Poll that shows former Secretary of State Hillary Clinton in front by 29 (!) points (yeah, like anyone’s going to believe that). Or the Emerson College Poll that puts Clinton up by nine or the ARG Poll that puts Sanders up by three or the Fox News Poll that puts Clinton up by six or the Quinnipiac Poll that put Sanders up by four or the NBC News/Wall Street Journal/Marist Poll that puts Clinton up by three. And all (okay, except Loras) describe a tight race. FiveThirtyEight, using its “polls-plus” model, gives Clinton an 80 percent chance of winning the Iowa caucuses. Its “polls only” prediction puts Clinton five points ahead of Sanders. The results of the final poll from Selzer & Co. from Bloomberg Politics and The Des Moines Register, which is considered the gold standard of Iowa polling (FiveThirtyEight calls Ann Selzer “The Best Pollster In Politics“), gave Clinton a three-point edge over Sanders. Its previous poll gave Clinton a two-point advantage, but it also showed a seven-point slippage for Clinton from earlier polls. Still, she got the Register endorsement—whatever that’s worth. It didn’t help her in 2008. Aw, screw it—we’re all sick of polls. So instead of biting and fighting between Bernie-bots and Hillary-ites, let’s look at some of the standard lines that have developed among pundits both inside and outside the Beltway. As a bonus, there are some insights on how the race is playing around the world. So here’s a sampling of analysis from both viewpoints—with some overlap. “It was idealism vs. pragmatism Sunday night at the Democratic debate in Charleston, South Carolina,” the talking heads agreed on MSNBC’s Morning Joe. “Clinton vs. Sanders: Will Democrats choose evolution—or revolution?” asked Washington Post columnist Eugene Robinson. “For Democrats, a revolutionary vs. a pragmatist,” said a CNN story. “Do Democrats want the revolution Sanders pledges or the experienced continuity Clinton promises?” asked the Los Angeles Times. “Realist Clinton makes better case than revolutionary Sanders,” wrote Chicago Sun-Times columnist Lynn Sweet. But when it came to demonstrating fluency in foreign and domestic issues—without saying a nasty word about Sanders—Clinton dominated the space of being ready to govern and deal with a gridlocked Congress. There was a different conclusion from 350.org founder (and Sanders backer) Bill McKibben. “Bernie Sanders keeps refusing to run the way that the pundits think he should—that’s what makes this primary so interesting and perhaps a turning point in American politics,” he wrote in an opinion piece on Huffington Post. The Beltway polls don’t quite get how much America has changed—how unequal and desperate it’s become. … Which is probably why actual people are also less worried about the other half of the “serious people” test imposed by pundits. Let’s look at how the media evaluate the two candidates’ approaches to health care. This analysis, by Paul Waldman of the Plum Line blog and The American Prospect, is from the Washington Post. Clinton’s theory of change is practical, realistic, and born of hard experience. But it’s also not particularly inspiring. It takes opposition from Republicans as a given and seeks to avoid direct confrontation with certain powerful interests. It’s essentially the same theory Obama operated on in 2009, when his administration set about to co-opt the insurance and pharmaceutical industries instead of fighting them. And it worked—after half a century of Democratic failure on health care, they passed sweeping reform. Sanders’s theory of change starts from the unspoken presumption that the ACA was in its own way a failure, because it didn’t change the system enough—there are still people left out, and though costs have been reined in, we still spend far more than countries with single-payer systems, and always will as long as we have a system based in private insurance. The problem with Sanders’s theory, however, is that it’s vague on getting from where we are to where he wants to go. He talks about the need to “stand up” to special interests and create a “revolution,” but standing up isn’t a plan. Likewise, there can be no argument that Clinton represents the establishment. She has an enormous advantage in the number of superdelegates, having received endorsements across the board from governors, senators, and House members, although they can always change their allegiance. Sanders has a handful. In a piece on Huffington Post, Sam Stein says many Democrats in power seem to share Clinton’s pragmatic view. But as he wins over voters with talks of a “revolution,” the senator is leaving a group behind. Many Democrats in Congress and in the administration aren’t persuaded by the Bernie Sanders theory of change. In the Guardian, Jill Abramson discusses why Millennials are flocking to Sanders, because Clinton is generating an “acute ennui” and that “shattering the ‘hardest glass ceiling’ doesn’t seem so revolutionary any more.” It’s all of the arguments rolled into one. “Hillary, can you excite us?” asks Osaremen Okolo, a 21-year-old African-American who supports Clinton but “misses feeling fired up” as she was for Barack Obama and as some of her friends feel about Sanders. Salon.com, in a piece by political writer Simon Maloy, put the two even further apart, with the headline “It’s Hillary’s ruthless pragmatism vs. Bernie’s unmoored idealism.” So it’s not just pragmatism and idealism, now it’s “ruthless” and “unmoored.” In the end, the argument goes, it doesn’t really matter. Of course, it’s entirely likely that this tension between Hillary’s pragmatism and Bernie’s idealism is moot. Should either of them win the presidency, they’re more than likely going to come into office with Republicans controlling at least one house of Congress, and the lesson of the past half decade is that Republicans won’t allow any action on Obamacare that isn’t destructive to the law. Assuming there’s no “political revolution” and assuming the GOP remains stalwart in its opposition, the more likely role of a Democratic president will be to fight tooth and nail just to maintain the health care status quo in the face of Republican sabotage. And Republicans must be salivating at Sanders’ line in the CNN Town Hall in which he stated, “Yes, we will raise taxes.” If that gets played in a Republican attack ad, it will exclude Sanders’ follow-up that the tax increase would be offset by dropping private health insurance premiums. It reminded me of Walter Mondale giving his acceptance speech at the Democratic National Convention in 1984 when he delivered the news that he planned to raise taxes if elected, since Ronald Reagan’s big 1981 tax cuts ballooned the deficit. “They won’t say that; I just did,” Mondale told the convention crowd, likely prompting many Democrats to do a face-palm and groan, “We just lost the election.” Reagan won in a landslide—and then raised taxes again, 11 times in all during his presidency, according to former GOP Sen. Alan Simpson of Wyoming in an NPR report. How is this race playing overseas? Both the GOP and Democratic races are not being ignored, especially because of the Trump factor. MPs in the UK House of Commons might think Donald Trump is a “wazzock,” but countries in Europe, Asia, and the Middle East are paying attention to the Democratic side, too. Even the People’s Daily in China has stories about the U.S. presidential race. This is just a sample, as many articles and columns were behind paywalls, not available in translated form, or using U.S. stories from AP or Reuters. Let’s look at the progressive Irish Times in a piece by the paper’s Washington correspondent. Clinton is struggling to hold together “the Obama coalition”—young voters, white liberals and African-Americans—that swept him to power. Sanders is beating Clinton two-to-one among young voters drawn to his purist liberal manifesto of economic equality and change against the establishment and a corrupt campaign finance system. So now we have Clinton struggling and Sanders with a “purist liberal manifesto.” Loaded words much? Let’s see: Who else had a manifesto… Right. Karl Marx. Here’s another viewpoint from a British journalist and longtime political commentator, Rupert Cornwell, writing for the Independent. It was dreadful but just about bearable last time, losing to a young guy who caught the zeitgeist and spoke like an angel. But losing to a septuagenarian self-avowed socialist, who resembles an Old Testament prophet in need of a new tie—and in America of all places? If there is a God up there, please, please not. I still go with the conventional wisdom that Hillary will win. Once the race moves beyond Iowa and New Hampshire to bigger states, her strengths among minorities and women should come through. She has an overwhelming edge in endorsements and among the so-called “superdelegates” who will be attending the Philadelphia convention in July. The top Democrats may be running neck and neck in the early primary states, but when it comes to assembling a stable of advisers on the Middle East, Hillary Clinton is way ahead of her chief rival, Bernie Sanders. The [Sanders] campaign’s top adviser, Tad Devine, is in charge of policy issues in general, including those relating to foreign policy and the Middle East. But Jewish and pro-Israel groups said they have had little contact with him or the campaign. For while the frequency of the Republican debates has caused the ratings to dip a bit over the months, the GOP events consistently outdraw the Democratic debates by millions of viewers. And if you are a fan of Sanders, O’Malley or Clinton or the Democrats’ platform this election cycle, you likely think this—and the DNC’s hide-and-seek debate strategy—is the first loss of 2016. So there you have it. The whole world is watching. Iowans will trudge their way to schools, churches, community centers, and public libraries to cast caucus votes by literally voting with their feet and moving to different parts of a room—no secret ballots there—to show which candidate they back. And those votes aren’t even really official, as no elected Iowa delegates are bound by caucus votes. Huffington Post gives a thorough and entertaining description of the nuts and bolts of the caucus process. Let’s just hope there’s not a snowstorm on Monday, as is predicted in Iowa for Tuesday. If that happens, we’ll be forced to endure countless stories about “Was the weather a factor in Iowa, and which candidate did it help—or hurt?” It’s IOWA, people. Folks who live there are used to driving in winter snow. I will vote in my Illinois primary on March 15. Come November 8, I will gladly mark my electronic ballot with an “X” in front of the Democratic candidate’s name. I hope we all pledge to do the same. Consider what might happen if we don’t. Originally published on Daily Kos on Jan. 31, 2016. ← If Donald Trump can’t handle Megyn Kelly, how will he deal with ISIS?